It’s amazing what can happen when passionate EO members commit to making a difference. That’s exactly what occurred during a Strategy Summit in 2013, when my chapter mates were having a “community outreach” break-out discussion. We talked about how we could give back to our city while supporting something we believed in. We wanted to create a lasting mark in the community. We focused on supporting veterans. We established an alliance with Veterans in Business Association (VIBA), a group of MBA students who are military veterans at Rice University. Soon after, the “Veterans Business Battle” was born. The goal was to host a competition for veteran-owned companies and strategic workshops, followed by an awards dinner that honored a “Veteran Entrepreneur of the Year,” someone who owns a business and gives back to the veteran community. The contest was open to all honorably discharged veterans across the U.S. who wanted to start or grow a business. There were four competition tracks: “Startup,” “Growth,” “Venture Capital” and “SBA Lender.” The goal was to fund at least US$1 million for veteran-owned businesses through investments and lending opportunities. In all, 146 applications were submitted, and US$720,000 in seed capital and SBA loans from qualified investors and investment firms went toward veteran-owned businesses (with ongoing negotiations pushing us toward our goal of US$1 million). 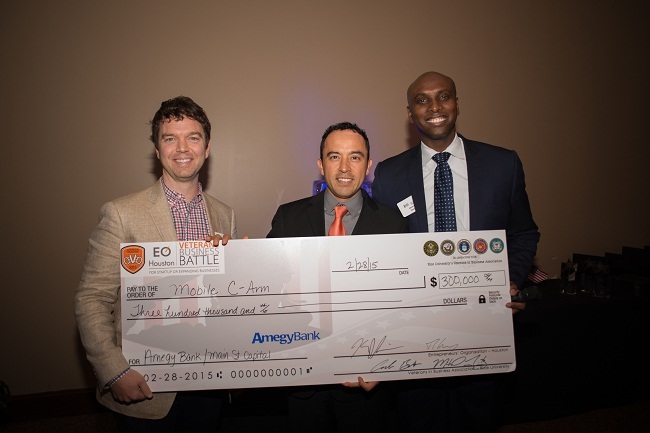 On 28 February, 15 of the “best and brightest” veterans pitched their businesses, with winners in four categories being recognized, and several others honored and funded. Ultimately, we selected three businesses to be considered for “Veteran Entrepreneur of the Year,” of which one received the honor. Our business workshops were also a success, thanks to the support of the Rice VIBA students. All in all, our collaboration with the mayor of Houston, the city and local media channels helped us support leading veteran entrepreneurs, generate significant goodwill and achieve quantifiable dollar value in earned media. Looking back, none of this would have been possible without a great team committed to getting things done. Every member had an equal and vested interest to make the event successful. As a chapter, we wanted to give back, promote entrepreneurship, support veterans and establish a “brand-able” annual event that we could be known for in Houston. I’m happy to say we did that and so much more!